My first project for the new year is an animal portrait, a Boer Goat sculpture. The Winterset Ranch website has a lot of excellent photos of these beautiful animals, which really show off all the different color patterns of Boer goats. I have a lot of different projects planned for the next few months, and this is the one I wanted to do first. The goats on the Heifer site are not Boer goats, which have a different shape to their faces, but I saw the photos of these goats and fell in love. I thought about asking you all to go to their website and pick out your favorite animal, and I’d sculpt the critter that got the most votes. I decided against it, just because I wanted to get started right away (and because you might have chosen an animal with horns that would be hard to ship. 🙂 ). To understand the underlying shapes, I looked at Nubian goats, which have more clearly defined shapes on their faces, and then looked at Boer goats to find the right profile for my pattern. I also looked at goat skulls on Google. I may need to make some slight alterations to the pattern’s profile as I sculpt, because I may have made the top line of the muzzle too straight. That’s an easy thing to change as I work. The hardest part will be getting my goat sculpture to stand up. 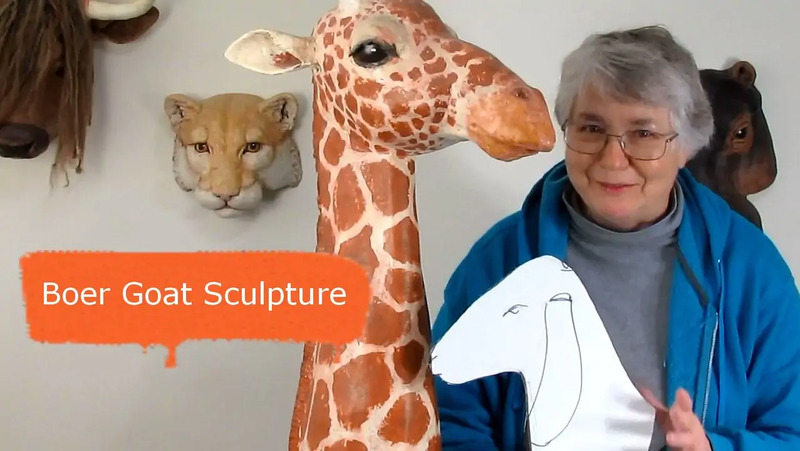 The plaster in the base of my Giraffe makes it stand politely on the shelf, but the goat’s lower edge will be much narrower than the bottom of my giraffe’s neck. If the plaster that I add is not enough to keep her from falling on her nose, I may need to make a stand for her. Any suggestions are more than welcome. 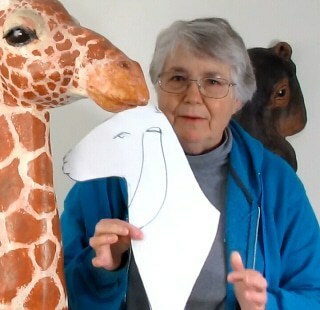 Click here to see how I made the giraffe, and how the plaster was added to the lower portion of the neck. I would do things a bit differently now, but it worked. Stay tuned for the rest of my Boer Goat portrait project. In the next few weeks I also plan to discuss the DIY “instant paper mache” that I used to make the hippo and cougar on the wall behind me in the video, I hope to do some character sculptures with the help of my resin skull, and I think I’ll add some wings to the half-finished unicorn armature that I used in one of my last videos and turn it into Pegasus. No horn – just wings. So – stay tuned for those upcoming videos, too. 1) If you run a dowel (or some metal rod) up into the neck, and then drill and glue the dowel into an offcut of timber (or a sanded slice of trunk), it will give a nice stable base. A bit of sanding and whittling the edges of the wood can give a nice character finish. If you want to avoid ‘swivelitis’ you can use a section of flat timber (such as a paint stirrer or ruler) instead of the dowel, but cutting a slot in the timber can be a little trickier. 2) Sometimes, if you get lucky, a recycling place/op shop will have the old, heavy candlesticks useable as bases. The ones that look like eiffel towers are very useful and the tops can be cut down with a hacksaw in a few minutes. 3) Visit a petshop and buy a section of vineroot used for reptile cage decoration. (I believe in the USA driftwood or something called Manzanita is more common) or hassle your local tree-lopper. Pick one that is nice and stable and position the head decoratively with a dowel and hole. 4) Lastly – make the root/twisty branch/driftwood from wire and paper mache – you can actually build it -into- the head, and the adjust branch ‘feet’ to be nice and stable before doing them last. Lightweight, but secure. Good ideas, Ruth. Thanks. I can imagine all sorts of sculptures working really well with any of your suggestions. Do you have some sculptures you’d like to show us? Jonni, Thank you for lending your considerable talent for a good cause. This video is very exciting to me. I must now go back and watch/rewatch as many of your videos as I can. Will you please put a notice on the Daily Sculptors Group page about what you are doing? If not, may I do so later? Sure, I can do that, just in case some of my readers aren’t signed up for my newsletter. Good idea. Thanks. Jonni- I had never seen such a goat as the Boer goat. They are rather hefty creatures with a body more like a dog than a goat. What fun critters they must be! I think you will have a problem with getting it to stand up if you try to keep that funnel shape of his neck even if you do your plaster technique. Why not just cut the neck off a bit so the base of the neck is wider? Or go with a trophy head sort of thing. I am looking forward to seeing the progress. I recently finished a goat sculpture myself, I need to figure out a base, then I will post it. they aren’t Boer goats but your standard barnyard type, such characters. Eileen, I agree that this shape isn’t going to be easy, and I doubt that the plaster will do the trick. It seemed like a good idea at the time, but I’m sure changes will be needed. That’s what happens when I show you all the steps that I go through, from start to finish – you get to see what doesn’t work, as well as what does. I’m wondering if I could make a concrete base for it, and have it look nice. I like the plain concrete base the squirrel is sitting on, but it would have to be very different to make it work for the goat. Or perhaps do a ‘swish’ at the bottom, to create a base without losing the line of the shoulder, which I really like. I would love to see your goat, even before you have your base figured out. Do you have a ‘before’ photo you’d be willing to share? I think an alpaca figure would be an excellent project seeing as they have similar heads to giraffes and it would be an interesting video for sure. And they have beautiful eyes! That would be fun – I’ll put it on my list. Have you made an alpaca? They certainly are beautiful animals. My brother and his wife had several goats (just ‘mutts,’ but they were still pretty) as pets, but that was pretty expensive. Are your Boer goats pets, or do you sell the kids? we want to breed but we don’t have a buck. Primero felicitarle por sus trabajos,es toda una artista. Lo segundo preguntarle si algún dia sacarán sus libros en castellano. Y tercero y último no podrían doblar o subtitular sus videos del YouTube al Castellano?. Gracias. Hola. I cannot afford to hire a translator to create subtitles on my videos, or to translate my books. Sorry.